Who knew 5 minutes into Christmas morning that I’d try to slice the tip of my thumb off with one of our new toys. Yep. We had only just begun checking out what Santa Claus brought us when I started bleeding all over our goods. And my boys weren’t sympathetic – they were excited. Santa Claus brought both of my oldest boys microscopes. They came in a big kit that has things like slides, a brine shrimp hatchery and unbeknownst to me, a circular slide-sizing slicer. 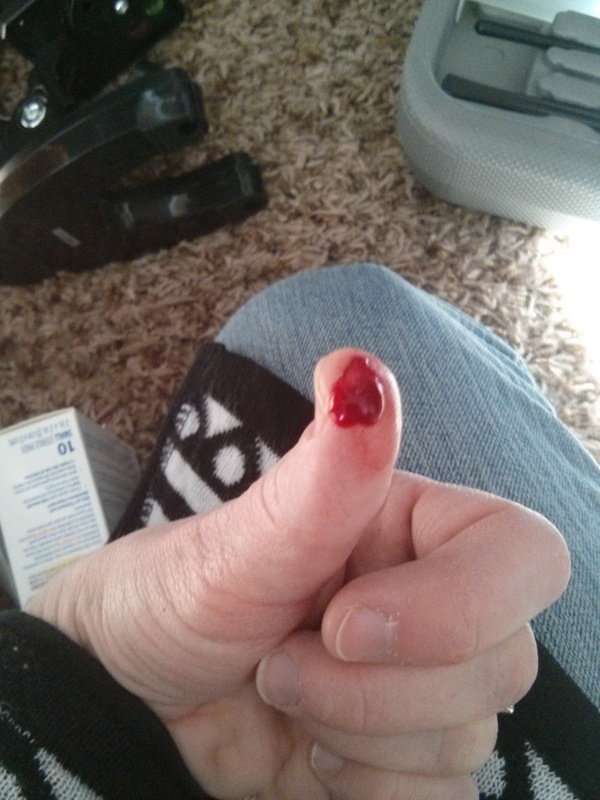 I was helping my 5-year-old get his kit out when I slid my thumb around the side of that slicer and nicked the tip. Yikes! It hurt. It was cut deep. I ran upstairs and fumbled one-handedly for a Band-aid while blood dripped from my left hand. I couldn’t open the packaging so I ran back downstairs and made my husband bandage me up. That lasted about 10 minutes. Then blood started dripping though my Band-aid. I got red all over a set of batteries I was trying shove into a new toddler music toy. After that I scrambled to find some gauze and medical tape. Then I spent the day with a giant left-hand thumb. Later that night my mother-in-law and I tried to liquid glue the wound shut. But the flapping skin didn’t take to the glue for very long. By the next morning I reopened the cut while trying to make my bed. Lame for me. Thrilling for my children. They had something new to study with their microscopes. My blood! I’m sure they didn’t dare ask me for a sample on Christmas. It was all too raw at that point. But now that I’d had a day with my wound, they were more than happy to round up their slides and stick them under my finger. I felt like a newborn getting its PKU test sample as we squeezed my finger for more blood. I let them each walk away with a slide filled with my “human blood.” We covered the slide, labeled it and stuck it under the microscopes. We spent a long time looking at it. And to be honest, it was COOL! It was a major sacrifice – all for the sake of science. At least it was me who got cut and not one of them. We zoomed in and focused our microscopes several times and one of my boys said he was able to see my “DNA.” Man they are smart and they love science. It took a long time for the skin on my thumb to heal. I felt like I was “all thumbs” for a while. Yet I’m kind of glad I could donate to the cause. But you better believe I’m not volunteering to donate any more of myself for the sake of new microscope experiments – at least not unless it’s another accident.